This recipe is an adaptation of Margaret Morris's recipe published in The Cheesemaker's Manual and a recipe published by Peter Dixon. The original recipes were written for large wheels of gouda, whereas this recipe is intended for use with 1/2 lb. baby gouda moulds. A pH meter is very useful for monitoring the development of your gouda, though not required. 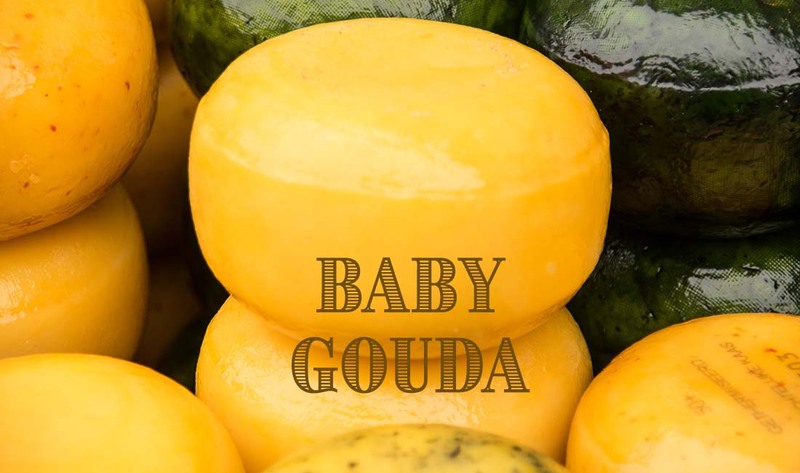 Accuracy in measuring temperature, pH, brine density, and humidity help tremendously in achieving a successful gouda. A soft, creamy texture will reward your well controlled efforts. Measuring spoons to 1/8 tsp. Sanitize equipment and prepare the double boiler by filling the outside pot with hot tap water. Add the milk to the inside pot and let it slowly rise to 82 - 84 degrees F. Remove the inside pot, use ice cubes or water as necessary to set the outside pot temperature to 82 - 84 degrees F, then return the milk-filled pot to its position in the double boiler. Add the Meso III direct set culture to the top of the milk. Wait 2 minutes. Add the annatto colorant and then stir the milk using 20 top/bottom strokes. Wait 10 minutes. Add the calcium chloride water and stir. Add the rennet water and stir for no more than 1 minute (further stirring could significantly interfere with coagulation). Let the milk ripen for 60 minutes. Check for a curd break. Once achieved, cut the curd into 1/2 inch cubes. Let the curds firm for 5 minutes. Rock the inside pot occasionally for 15 minutes to agitate the curds (if the whey is turning white, stop agitating and wait for the curds to become firmer) and then allow them to settle for 5 minutes. In the meantime, bring a pot of unchlorinated water (at least one gallon) to a boil. Add 1 pint of 175 degree F water to the pot in order to scald the curds but be careful not to directly splash the curds. Bring the outside pot temperature up to 93 degrees F. Rock the inside pot gently for 10 minutes. The temperature should stabilize around 93 degrees F. Let the curds settle to the bottom of the pot for 5 minutes. Remove all of the whey you can access with a solid ladle into a large measuring cup. Use a cheesecloth-lined colander to help separate the curds and whey. Your goal is to remove whey representing 33% (11 1/2 cups or 92 oz.) of the original milk volume plus added water during Step 6 and 7. You may want to save this whey for later use in the brine. Rock the curds gently in the inside pot for 5 more minutes. Remove more whey with the solid ladle until you have measured the removal of 33% of the original milk volume (it may be necessary to agitate the curds longer to get them to release more whey---in that case, continue rocking and remove what whey you can every 5 minutes). Replace the removed whey with the same volume of water at about 115 - 120 degrees F. Bring the outside pot temperature up to 98 - 102 degrees F.
Stir the curds gently and/or rock the inside pot occasionally for an additional 30 minutes to keep the curds from matting. If the curds are breaking apart, that's fine. If the whey is getting milky white, that means you are losing fats to the whey and you should stop stirring before more fats are lost. The final temperature should stabilize at 99 - 100 degrees F. Allow the curds to settle to the bottom of the pot. Perform a Texture Test by removing a small handful of curds from the pot. Squeeze them together in your hand. They should mat together. They should also separate into individual curds again if you rake them with your fingers. Do not proceed until you pass this test---continue stirring the curds in the warm pot if necessary. Prepare your draining moulds and fill them halfway with curds using a perforated ladle or slotted spoon. Use a spoon to press the curds down into the moulds and smooth the surface and eliminate mechanical openings between the curds. Fill the moulds to the top and smooth them again. Place the lids onto the curds and press very lightly (1.5 lbs of weights per lb of cheese) for about 30 minutes. A pan set across the moulds with a light weight such as a wine bottle works well for pressing. The temperature should be no lower than 65 degrees F or acidification will not proceed. Flip the cheeses over, this time wrapping the top of the cheeses as well, and press for another 30 minutes. Flip them a final time, and optionally double the pressing weight for a tighter knit curd. Leave the cheeses to drain for 4 - 16 more hours (dependent on temperature), or if you have a pH meter wait until the draining whey reaches 5.4 - 5.6 pH. Prepare a light brine (8 - 10 baume or 1.057 - 1.074 Specific Gravity) and brine your cheeses for 2 hours. Ideally, the brine will be at the same temperature as the cheese. For further instructions on preparing a brine, see The Beverage People Brining Directions handout. 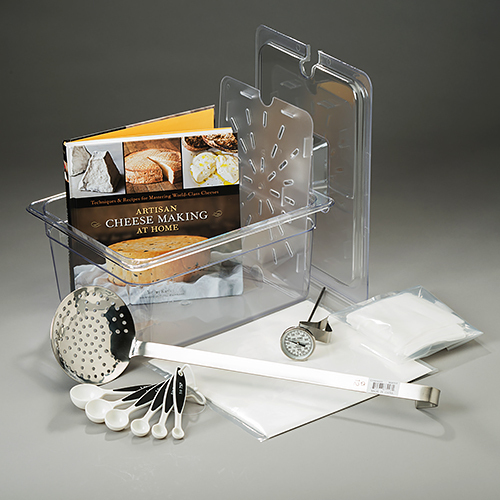 Allow the cheese to dry for at least one day (50 - 60 degrees F, 80 - 85% humidity) before coating with anti-microbial Soft Cheese Coating. This coating will dry in about 2 or 3 days. If you intend to eat the cheese young, hard wax it to keep in the moisture. If you intend to age the cheese it can be placed in the aging room/refrigerator with only the soft cheese coating applied. Aging should take place at 45 - 55 degrees F and 85 - 90% humidity. Allow at least 2 weeks before eating. Enjoy!